Photo-Brush is fully-featured image editing suite that offers an image editor, filters which create natural and artistic drawing effects, a retouching tool, a tool for optimizing photographs and an image viewer all in one! This software program has many of the tools and effects for adjusting and photo retouching found in many image editing programs such as Adobe Photoshop. Photo-Brush also includes some effects and tools you're not likely to find in other program. Its image editor is among the few that supports importing and editing EXIF files from digital cameras. 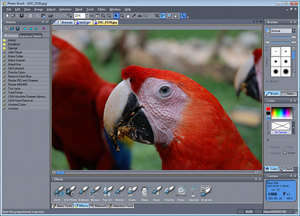 Photo-Brush 5.30 is a shareware program and can be used as a demo to try the software until the free trial period has ended. A full version of the program is available after the trial period ends. For security reasons, you should also check out the Photo-Brush download at LO4D.com which includes virus and malware tests. Additional screenshots of this application download may be available, too. Photo Brush has a presence on social networks. Photo Brush download been highly rated by our users.